hope you are having a great fall and pre-holiday season! Stitching feverishly all those hand-made gifts? SHHH…don’t tell, but I kinda decided in my head that this year I will give my family all things made by me…one way or the other! Lets see if I can do it, but will report here how it goes. How about you – handmade for gifts or not, this year? Kimberly from Fat Quarter Shop shared a lot, here is what happened on Sundayand on Saturday and during the so called Schoolhouse (where all different designers show and explain their products). You can also see a whole video about Moda Fabric Schoolhouse HERE . 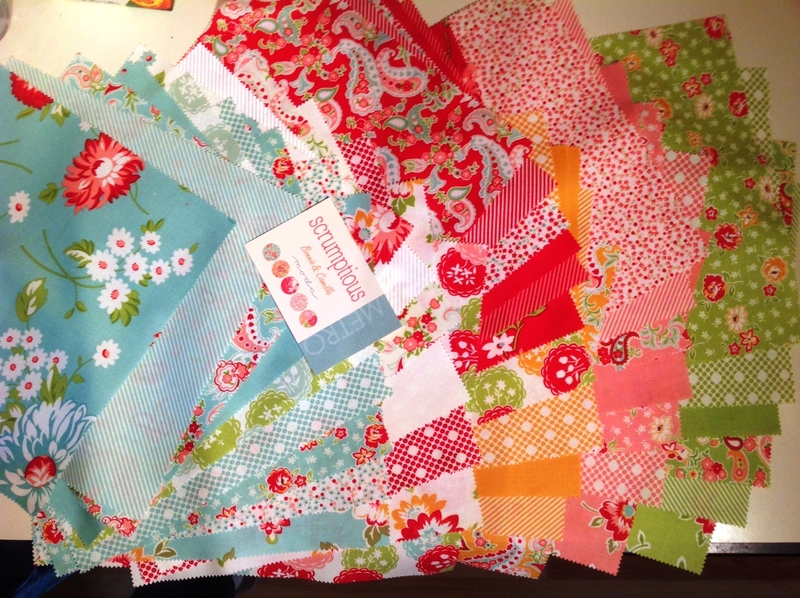 It is fun to hear what designers have to say about their newest fabric lines and other things! Pat Sloan shared some beauties on her blog too, HERE and HERE too. I ma sure there will be more and more – you can just Google Quilt Market and I am sure many blog posts will pop-up in next few days. I love seeing what new fabric and gadgets are coming next, it is always inspirational! Talking about inspiration, I had a flurry of it few days ago! My baby sister (who lives in Australia) needs a quilt. Better said – needs a “hug” from her big sister and this is the best one I know of, apart from me being there in person. So – this amazing layer cake (Scrumptious, by Bonnie & Camille, for Moda Fabric) was so her colors, but also for me – so happy, happy! 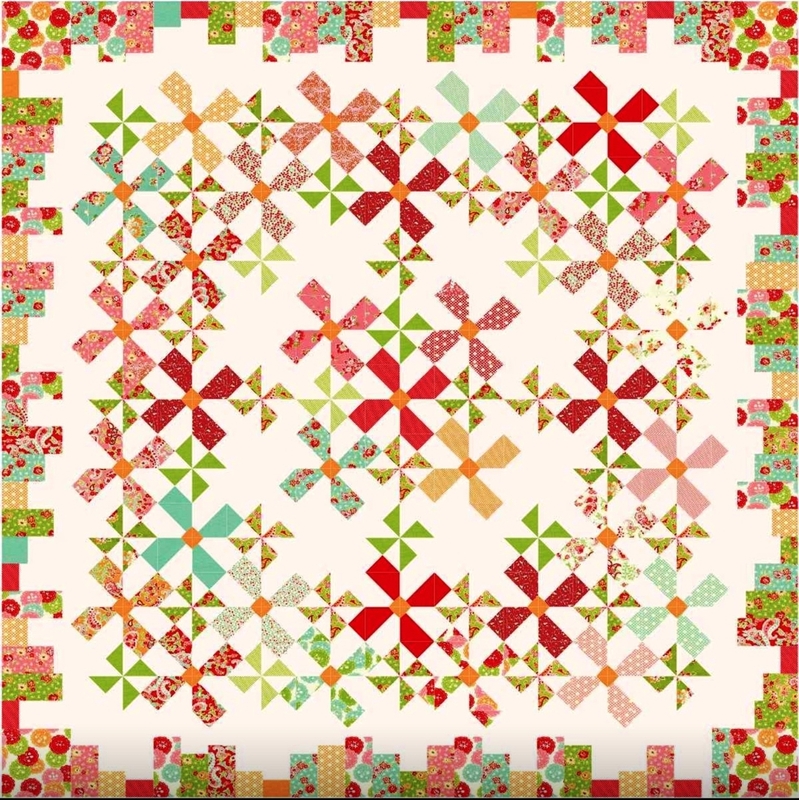 It arrived and all I saw for the quilt was flowers, flowers… So I quickly colored on of my designs I did before and VOILA! I can’t wait to get a good looking shade of off-white (almost white, but not quite…) for background and start stitching! This was done so quickly thanks to my trusty EQ7 (Electric Quilt software) and the great feature that now most fabric companies have on their web site – to download the entire collection of fabric with one “click” and then be able to import it into EQ – isn’t that great? Do you use EQ? Are you one of many who say – I got it but never used it? Or have trouble using it? I love EQ and if there is interest in the Guild, we could do a series of guild workshops on it? What do you all think? PS – on a personal note: looking for some input on my blog and trowing in a giveaway as a thank you, so hop on there and let me know – thank you!! I love that idea for the Guild. I have to say I have it but do not use it the way I should. Your quilt will be beautiful. I don’t have EQ, but would like to explore using it. Right this minute, using graph paper and color pencils on new project!!! Thanks for web sites. Yes! there are so many programs that would be helpful for design. Great idea for the guild.